What Does an Illuminated Engine Light on the Dash Mean? Formally known as a MIL, or Malfunction Indicator Lamp, the check engine light has been in use for a very long time in vehicles. So, what does a check engine light mean? 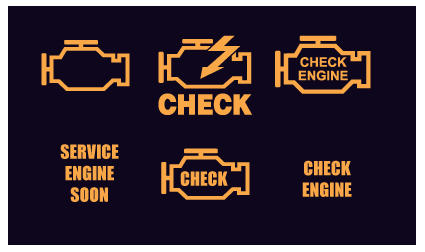 The check engine lights function is to notify a driver that there is something wrong with one of the many systems your vehicle has. An illuminated check engine light doesn’t necessarily mean that there is something wrong with the engine. Lit up CEL can be either in the electrical, emissions, engine, or transmission. When most people see a check engine light on, they immediately will think the worse, and a feeling of dread will wash over them, and they will begin wondering what is wrong or what it could mean. It is because no one likes the engine light, and in most people’s eyes it symbolizes costly repairs, or that the car is just going to stop working soon. What should you do when you see this little light lit up like a Christmas tree on your dash? The best thing you can do is take your car in to get a code reading done. All cars from 1996 and up are outfitted with the standardized OBD-2 plug in, and it allows scanners or computers to talk to your vehicle’s computer. Getting your car’s trouble code is as easy as bringing it into a shop or scanning it yourself if you have a scanner. The most important thing about the checking the engine light is that you do not have to wait to have it looked. In some cases, driving on a car that has a problem can become an even bigger problem if not corrected. It is not recommended just to shut off the light and not fix the problem. While you may be tempted just to shut off the light, it won’t fix the underlying problem. It is necessary to note that just because you see this “warning light” It doesn’t mean you need to stop driving. Commonly, the CEL is related to an emission problem, for instance, a BMW will have a normal check engine light on for the oxygen sensor. This emission item is an important one to correct because if you drive too long, it can break the catalytic converter, and that is a much more expensive repair than an O2 sensor. Whenever you see an illuminated check engine light, get your code read, and correct the problem. It will help extend your car’s life and keep it functioning properly.